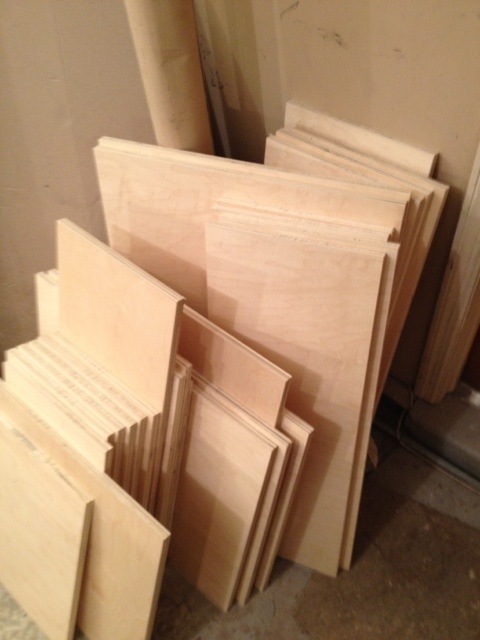 I finished cutting up all the plywood needed to make my office cabinets today. All told I used about 4 and a half sheets of prefinished maple plywood. Had to rent a van to pickup the plywood from Russel Plywood down in delaware. Breaking the plywood down was a piece of cake with my fancy Festool tracks saw. I drew all the cut lines on the sheet of plywood using my trusty drywall square, and then just layed the track down on the line and cut. Was a bit tricky to layout all of the panels to make sure that a cut for one panel didnt run into another, but it was managable. Next time I need to remeber to use a square on the track just before I cut though as I noticed a few of my cutta are not perfectly square.